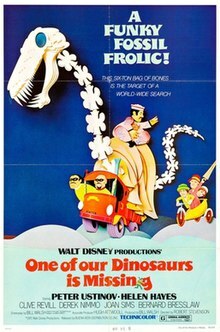 One of Our Dinosaurs is Missing is a 1975 comedy film, which is set in the early 1920s, about the theft of a dinosaur skeleton from the Natural History Museum. The film was produced by Walt Disney Productions and released by Buena Vista Distribution Company. The title is a parody of the film title One of Our Aircraft Is Missing, in which both Peter Ustinov and Hugh Burden also appeared. The film was based on the 1970 novel The Great Dinosaur Robbery by David Forrest (pseudonym of David Eliades and Robert Forrest Webb). Escaping from China with a microfilm of the formula for the mysterious "Lotus X", Lord Edward Southmere, a Queen's Messenger, is chased by a group of Chinese spies. Back in London, Lord Southmere manages to escape from a chauffeur who is trying to kidnap him and then runs into the Natural History Museum. Chinese spies, led by Hnup Wan, follow him, so he hides the microfilm in the bones of one of the large dinosaur skeletons. He is relieved to meet his former nanny, Hettie, in the museum, and asks her to retrieve the microfilm. Southmere then faints and is captured by the Chinese, who tell Hettie and Emily (another nanny) that they are taking him to a doctor. Hettie and Emily enlist other nannies to help them search. They hide in the mouth of the blue whale display until after closing time and then begin looking over the skeleton of a Brontosaurus. They are unsuccessful and most of them have to return home to care for their children, but Hettie, Emily and their friend Susan remain to continue with the search. They are captured and taken to the spies' London headquarters, underneath a Chinese restaurant in Soho. The nannies are locked up in the 'dungeon', with Lord Southmere, but are able to outwit their captors and escape. Meanwhile, the spies have decided to steal the dinosaur, so that they can search it properly. That night, they trick their way into the museum. The three nannies follow on a motorbike and sidecar and watch from the shadows. After the Chinese load the Brontosaurus skeleton on the back of their steam lorry, the nannies steal the vehicle. The spies give chase through the foggy streets of London in their charabanc and a Daimler limousine, but the nannies drive into a railway goods yard, onto a flat wagon at the back of a train, and are carried off to safety. The nannies fail to find the microfilm on the skeleton. Meanwhile, back in London, Hettie's two young charges, Lord Castlebury and his younger brother, Truscott, have been captured by the spies. They are taken to the museum and the chief spy retrieves the microfilm from the other large dinosaur, a Diplodocus skeleton. The two boys are allowed home and tell Hettie the news. Realising that Lord Southmere is now in danger, Hettie organises a rescue. Hettie and her team of nannies invade the Chinese restaurant base and battle with the spies over Lord Southmere. Meanwhile, Emily and Susan return with the Brontosaurus skeleton and the lorry and bring the fight sequence to a shattering conclusion. Everything ends well and the secret of the mysterious "Lotus X" is finally revealed. It turns out that Lotus X is actually a recipe for Wonton soup, to which Southmere says that he tried to tell Hnup Wan that he was a businessman. Wan then advertises the recipe and makes peace with the nannies. The book on which the film was based, The Great Dinosaur Robbery, was aimed at an adult audience by its authors, Robert Forrest Webb and David Eliades, and was set in New York. The authors, both very experienced U.K. national journalists and best-selling authors, extensively researched material in New York and were greatly assisted by the American Museum of Natural History, which is situated alongside Central Park, and by the New York Police Department responsible for that area. The authors were disappointed that the humour of the film was aimed at a very much younger audience than that in the book, which had been published, in several languages, extremely successfully throughout Europe and also in Australia, New Zealand and the U.S.. This film was made on location in England at Elstree Studios and Pinewood Studios, along with location shoots at London Zoo, the Natural History Museum and around Windsor, Berkshire and Holyport Green, Maidenhead. The Diplodocus skeleton model was later used in Star Wars Episode IV: A New Hope, in the opening scenes in the Tunisian desert.